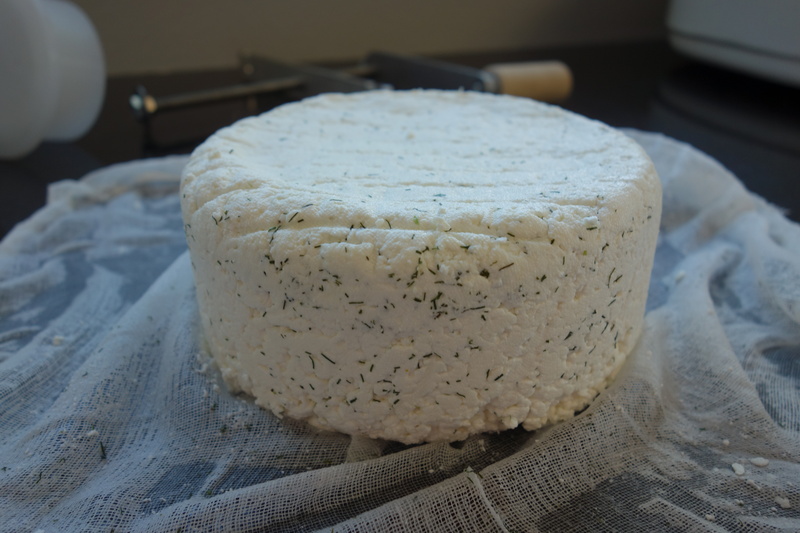 Cheddar isn’t the only cheese that we at Decagon have made. (Yes, there was the provolone mishap but I don’t know if we’re going to count that.) 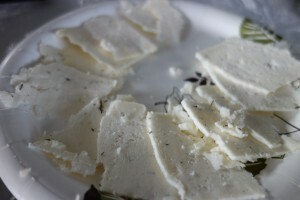 We’ve also tried our hand at Parmesan and Havarti cheeses. After pressing the Parmesan it was dunked in a brine for awhile and then put in a “ripening box,” an environment that allows for the cheese to age. 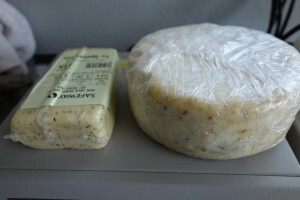 The Parmesan sits on a needlepoint mat (I read online that it works like a cheese mat) inside a Rubbermaid plastic container, which has been placed inside a refrigerator set at 50 to 55 degrees Fahrenheit and fluctuating between 60-70% humidity. 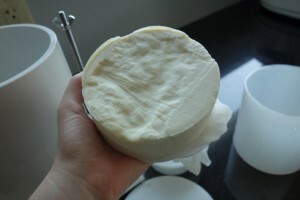 The cheese has since gone about a shade darker of cream, and has accumulated a bit of mold but not too much. 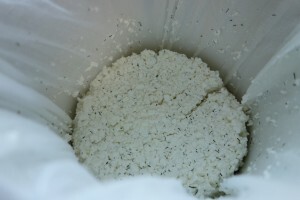 The surface of the cheese is pretty firm, so whatever mold has grown on the cheese is easily wiped away with a piece of cheesecloth dipped in a 1-to-1 solution of salt and white vinegar. Yesterday I took a core sample of the Parmesan for testing, and it came back with a reading of 0.9202 aw. 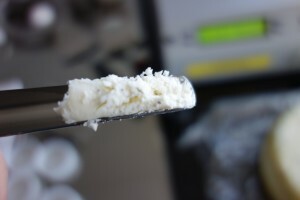 The sample was very firm and solid and did not crumble, and I’m hoping that in a few months it will be fit to be grated and used like any other Parmesan. While this Parmesan is drier than the other cheese I made (we’ll get to that in a moment), it is still fairly moist, and much moister than that poor provolone from last year that got stuck in a 10% humidity environment. About a week later I made a second cheese: dill Havarti, a semi-soft cheese that would not (and did not) take long to age. It took me several hours to cook and cut the curds, drain them, then press them. 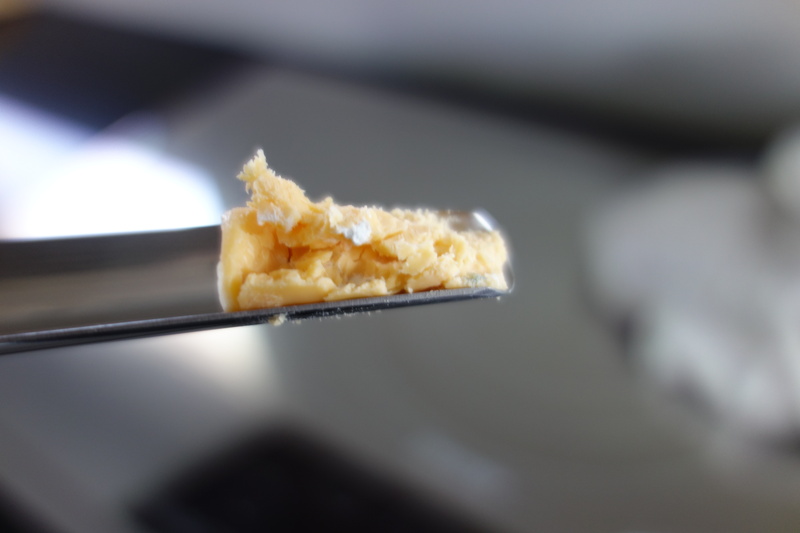 Scott’s cheese book said the Havarti was ready to be eaten after being pressed, but to me it still seemed to be a spongy, curd-y mass that could definitely still be worked with. So per further instructions from the book, I plopped it in a heavily saturated brine overnight to try to draw some of the moisture out. 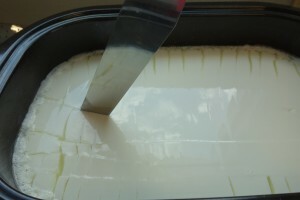 After the brine, the cheese was set to air dry at room temperature for another day before I stuck it in a ripening box of its own. 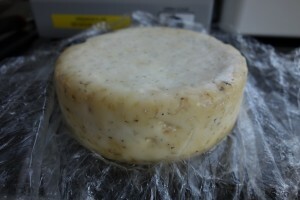 Over the next few weeks in the month of July, I went to check on my cheese, flipping each one daily (only the first two weeks for the Parmesan, now it only gets flipped twice a week), and wiping off any mold growth with a cheesecloth dipped in the vinegar salt solution. As time passed, I found myself wiping considerably more mold off the Havarti than I did the Parmesan. 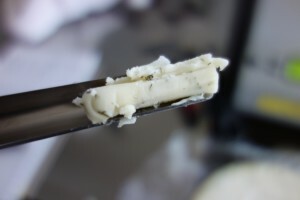 This is because while both were in the same types of ripening boxes and stuck in the same refrigerator, the Parmesan, a firm cheese, was formulated such that it was less wet than the Havarti, a semi-soft cheese. 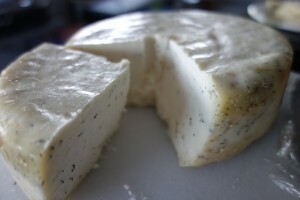 Mold isn’t always an undesirable quality in cheese, but generally Havarti doesn’t have mold growing on it when you buy it from the store. 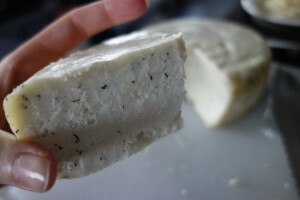 The Havarti I made got a variety of interesting molds growing on it; there were brownish spots, blue-ish green spots, and sometimes a slight white film. Most of the more powdery molds were removable, but I was only able to scrub off some of the brownish spots that seemed embedded in the cheese’s rind. Speaking of the rind, as time passed the rind (or outer surface of the cheese) grew harder and became almost yellowed, the edges in particular. Recently I was also noticing some cracks developing in the rind, which I took as a sign that it was time that the cheese should be eaten. 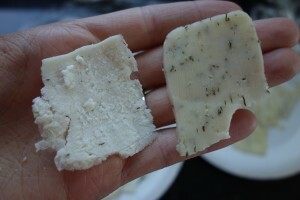 In order to make a comparison, I went to the store and bought a hunk of commercially made dill Havarti. I noted before testing water activity that the store bought version was much more spongy and moist than my firmer round of homemade cheese. 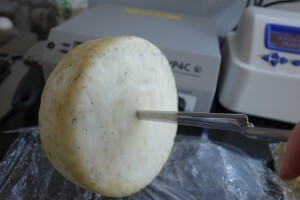 Then I took samples with the cheese trier. Here’s where it got interesting. Check out the difference in texture of the samples! 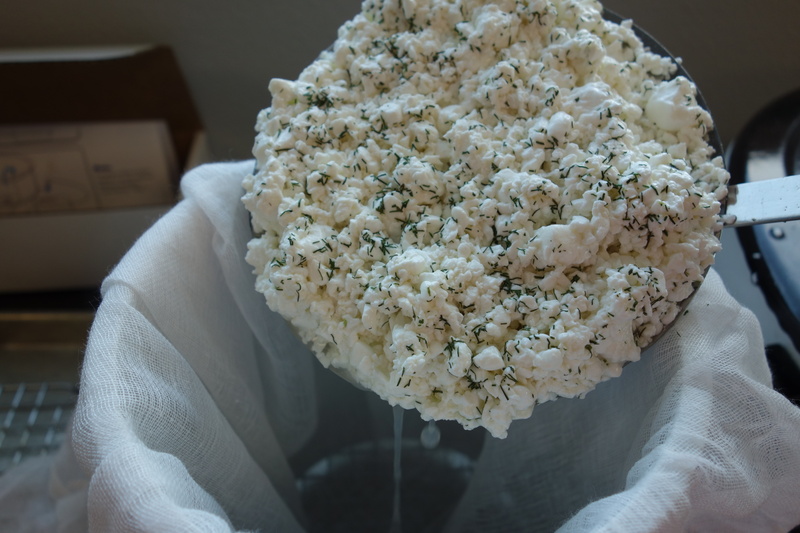 The homemade turned out to be pretty crumbly, almost with the consistency of feta (I guess we should have tried to keep the humidity up in the fridge…). The store bought was just like your average Havarti, pretty spongy and soft. Upon testing their water activity, there actually wasn’t too huge of a difference. The store bought Havarti gave a reading of 0.9640 aw, while the homemade Havarti gave a reading of 0.9568 aw. Not too big a difference it would seem, but it was just enough of a difference that the homemade cheese was of a crumbly texture while the store bought was much smoother. It’s interesting how only a little change in water activity can have such an influence on quality of a product, as demonstrated in this cheese test. It was pretty dry and crumbly, and if you can see the little white flecks…yep, that’s mold. The cheddar read in at the lowest water activity of all the samples, reading at 0.8606 aw. I’m not sure if that means we should wipe off the mold and eat the cheese, or try to up the humidity in the fridge and see what happens. Pretty isn’t it? (if you can call cheese pretty) As you can see in the below pictures, the cheese was pretty crumbly and brittle, and it was a little challenging to slice it with a cheese slicer without the slice breaking into pieces. I tasted both myself, and while the homemade one wasn’t really what I’d call Havarti like you’d get from the store…it was still good! Both were tasty, but were completely different cheeses. It was a bit dry in comparison to the store bought but had a nice flavor with a tang that probably came from some of the outer remains of mold. Can you see from this example and these pictures how testing water activity can make a HUGE difference in taste, texture, and overall quality of a product? Then it was time for the taste test. Our new company chef suggested I serve the cheese with apple slices (the ones I used were Fuji), crackers (I used Keebler Club crackers), and a little drizzle of honey on top. Best. snack. ever. 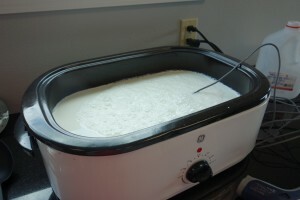 Out of 17 participants, 7 preferred the homemade cheese! The majority preferred the store bought, but that was to be expected. I found from the comments made on their feedback sheets that really it was just a matter of preference. Some people like smooth, moist, mild cheeses, while other people like crumbly, slightly tangy cheeses, and this was reflected in their comments. While one person said the homemade had an “overall nice flavor,” another person said the homemade cheese was “less yummy.” In the end, it was just whatever kind of cheese people preferred. I feel the test was successful, especially since everyone was happy because they got to have a nice afternoon snack of crackers, cheese, and apples. While I had intended to make something like store bought Havarti, I ended up with something not quite like the Havarti we’re all used to. 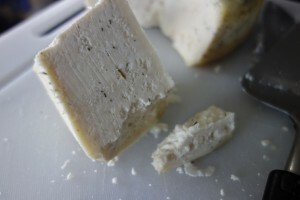 I am glad though that my homemade cheese still ended up tasting quite nice. Since I ended up with a pleasant tasting product despite the odds, I feel this first completed cheese venture was a success. Join us in forthcoming blog posts to see the progress of my Parmesan and Scott’s farmhouse cheddar, using water activity to understand how water activity readings relate to product properties.